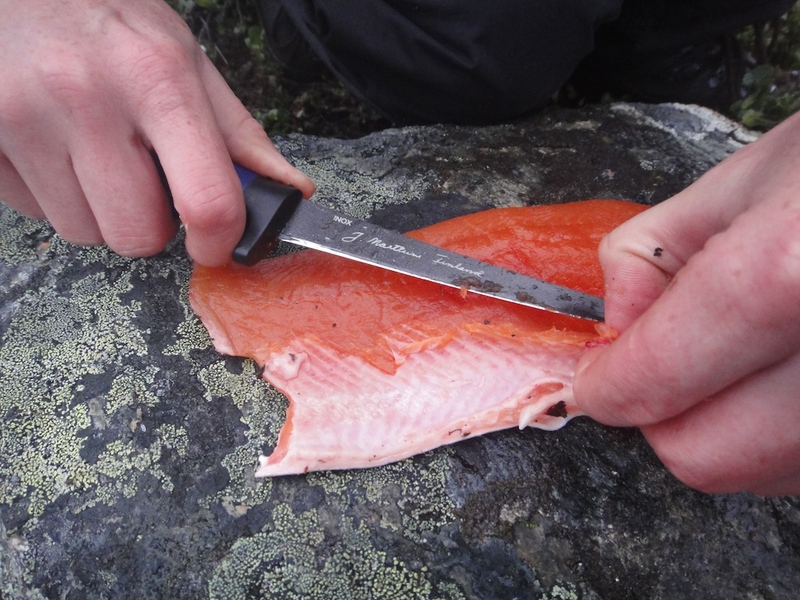 As a longtime friend of Fredrik – the creative genius, drummer and flyfisherman of J&FF – I know that the subject of food is of utter importance. Whereas most people have probably been through the following stages, I will use Fredrik as an example, partly because he’s a nice guy that loves eating, and also because I have some photos for illustration. 1. Bring it to the max! 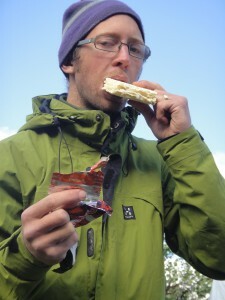 Before a long hike you should eat well to keep the body going for hours with a heavy back pack and a demanding terrain. Family pizza for instance. There’s no need to save on weight, fat or carbohydrates (but Fredrik is always whining about the price of the Norwegian food). Now this is a form of art. 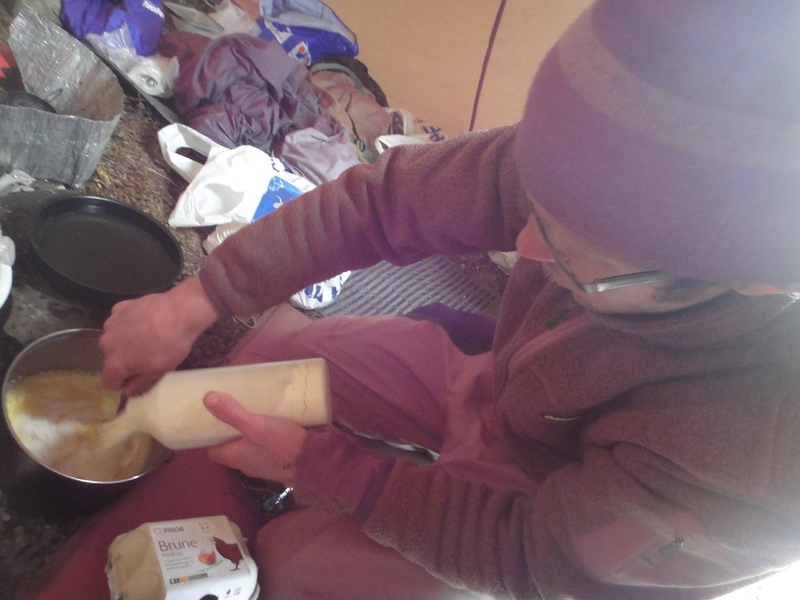 On a long trip the meals have to be planned so that there’s: a) enough food, b) not too much food to carry and c) tasty and varied food that is possible to prepare with very simple equipment (this is the most difficult one). Fredrik is a true master of making in-field gourmet dinners. 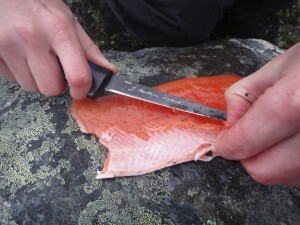 We’ve had some of our lives’ best three-course meals in a tent in the middle of the Scandinavian tundra, prepared by Freddy the master chef. However, planning the amount of food can go wrong. Too much food and you end up competing who can make the longes “squeeze” out of a tube of soft cheese by jumping on it. 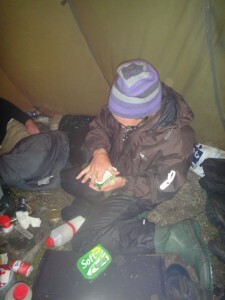 Too little food and you realize it’s two slices of bread a day for the rest of the trip. Believe me, both have happened us. 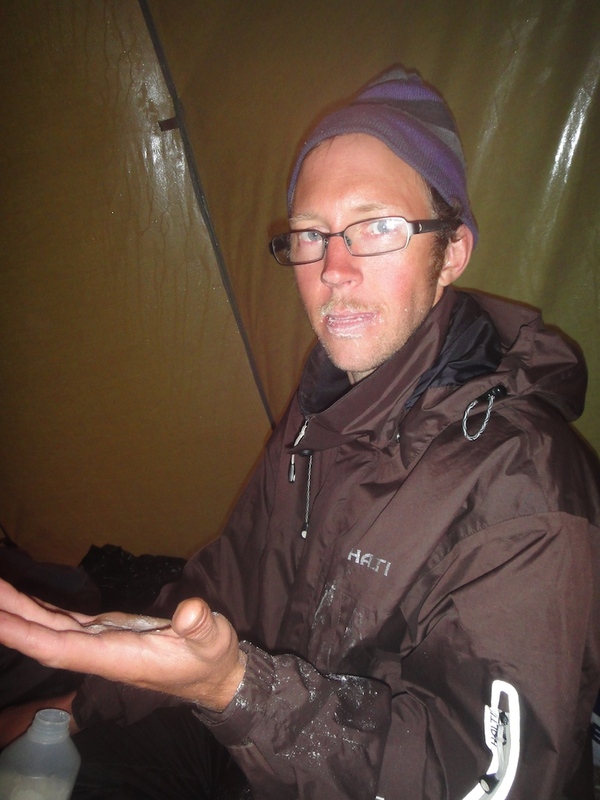 These photos illustrate some of Fredrik’s methods for surviving the extreme situations that may occur when you fish too much and eat too little. The recipes are in the photo titles. Time for lunch now, stay tuned! The flour eating was unbelieably funny. That is actually the hungriest man I have ever seen. Fredrik is an excellent chef! I think, that more food is better than less. 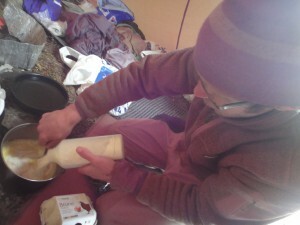 Ha ha, the flour pic… I was pretty hungry. 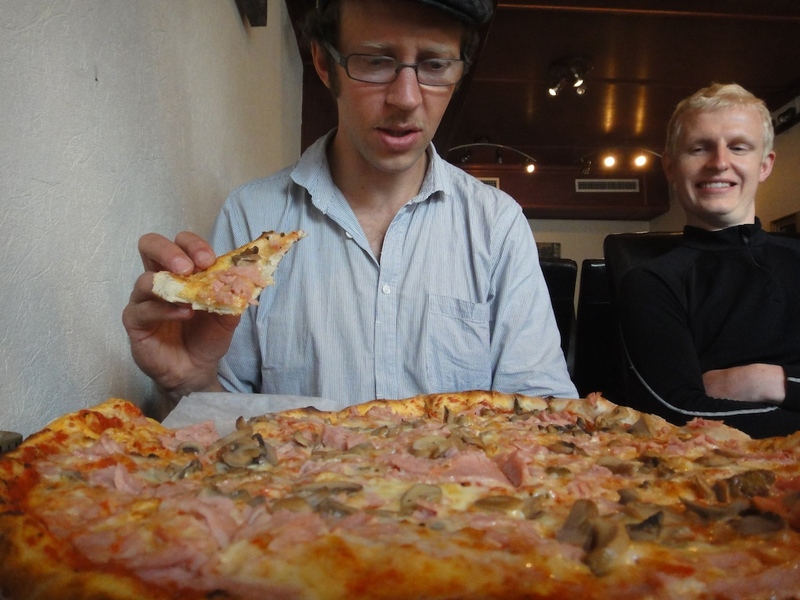 And that pizza, it was actually insanely big! Haha I think we have all been there..one too many beers..not enough money for a take away..only a bag of rice in the cupboard..to hungry to wait for it to cook…why does my stomach hurt so much? P.s have you guys ever used a Kelly Kettle? They are the ultimate bit of camping equipment! But the KK would be perfect for a shorter trip for sure! 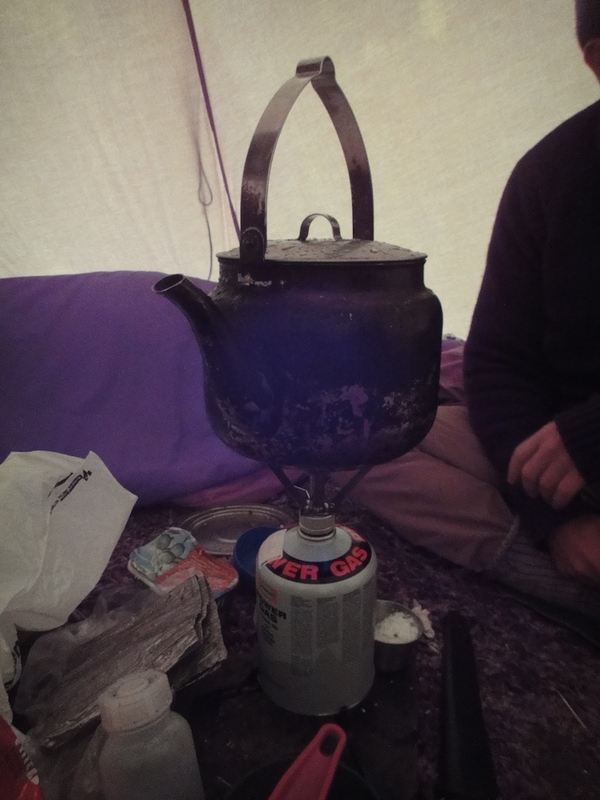 a friend, who shall remain nameless after spending toooo many nights on the famous Conningbrook lake, decided on a cold and windy evening under canvas… that, wait for it, Curry flavoured Porridge would be a tasty meal. I can suggest, from the look of puppy poo, it wasn’t that appetizing. How do I know this? well, the ejection of the “porridge” was placed at a vantage point for birds and wildlife. for 2 years after this occasion, it was still staining the place where it landed. another occasion, I ate 1lb of turkey meat, just fried, with a jar of pickles poured on top – again on a trip, far to long for good mental health. I think my colon thanked me for returning to civilisation.